The main purpose of SkyNomad Intermediate Course is to prepare the low experience pilots for active flying and safe discovery of new horizons in paragliding. Before starting the course you will make a demo flight from the training hill to direct us for your previous experience and where to focus on your further training. - be able to judge weather conditions for safe flights and to be proficient in takeoff and landing without assistance or supervision. - be continuing straight form a Beginners course or to have had uninterrupted flying experience since the finishing of your initial training. - have a minimum of 35 flights 5 of which from high altitude ( >300 m AGL) and mimimum of 1.5 hours of total airtime. - have not flown for more than 6 months after your initial training or have had an interuption in flying for more than 2 years. - have not met the mimimal criteria for number of flights and airtime noted above. Day 1: Introduction of Active Flying: Pitch Control. 2-4 flights from the high mountain. Simulation of pitch disturbances and accelerating the paragliders self recovery. Day 2: Roll Control: 2-4 flights. 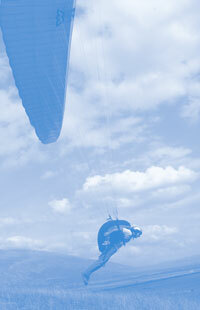 Simulation of roll disturbances and accelerating the paragliders self recovery. Day 3: Assymetric Collapses: 2-4 solo flights from the high mountain. Simulating asymmetric and frontal collapses in the air. Developing skills of active flying in turbulent conditions. Day 4: Symetric (fontal) Collapses: 2-4 solo flights from the high mountain. Simulating symmetric and frontal collapses in the air. Developing skills of active flying in turbulent conditions. Day 5: Desent manouvers: 2-4 solo flights from the high mountain. "Big Ears". Landing on alternative and small fields. Day 6: Spiral*, Excercise repetition: 2-4 flights. Performing spirals as a quick descent technique in tandem/solo based on instructors discretion. Repetition of previos excercises and consolidation of the stability techniques. * Spiral dives are a complex maneouver and are not a mandatory part in the curriculum. Spiral dives are always performed first during a tandem flight and after that based on instructor discretion may be attempted solo by the student. Depending on your temper you can continue paragliding with relaxing long altitude gliding or ridge soaring flights, paramotoring, acrobatics or the eternal cross-country flying. It is also a good idea to have a week of assisted flying after the intermediate course. Can't decide between Intermediate course and BHPA CP - check the difference here!